Hi Patti! 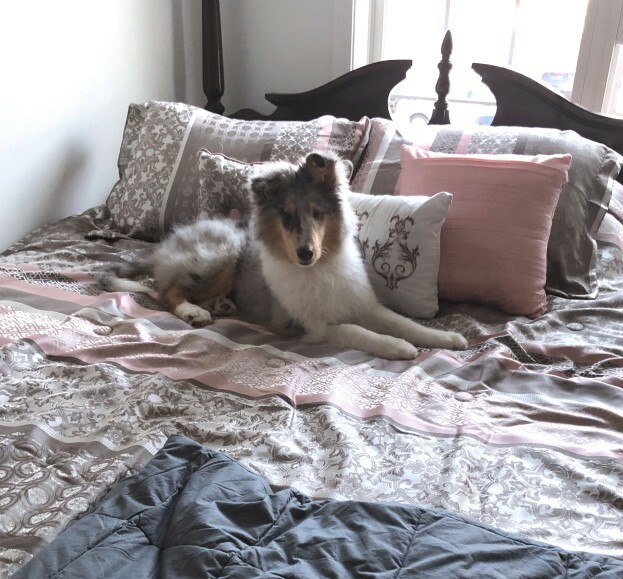 I got a new comforter set and Cosmo approves of it! Thought you’d like to see what a little prince he is. He’s getting so much better for brushing and bathing as well! So many milestones the past week as well. He has FINALLY mastered going up and down the stairs. 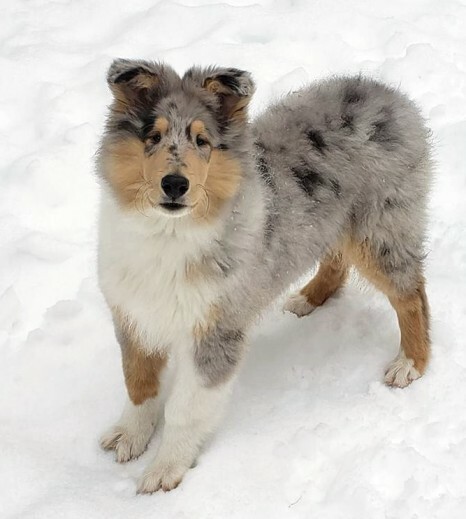 He learned how to sit and to come. 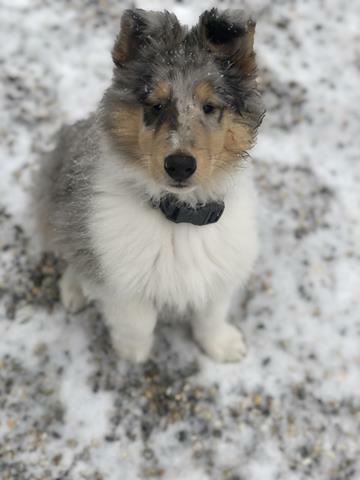 He starts his basic training class next Thursday! I’m just so in love with him! Thank you for blessing me with the best thing to ever happen to me! 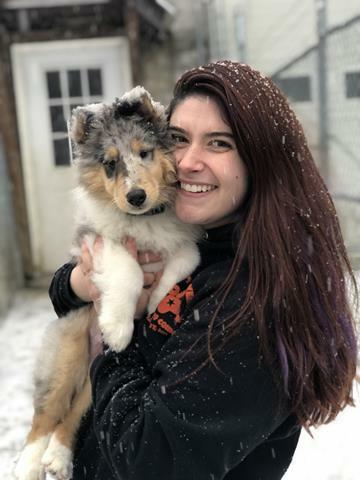 Just to let you know how happy I am with the puppy I adopted from you last Saturday. I named her Annabelle. She is adjusting quite well. My older brother just adores her, he is dog sitting her these last few days while I am a work. My 3 brothers and I are dog people, we love dogs. 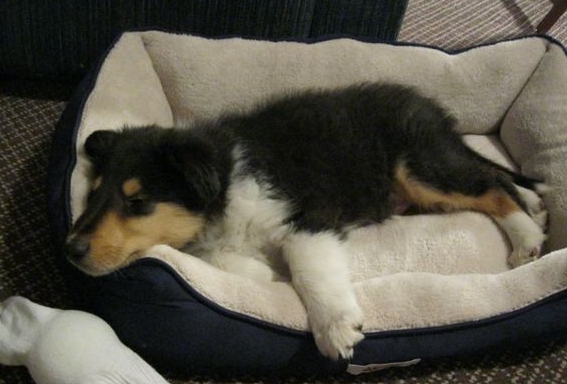 Here is a picture of her (above) after playing with my brother yesterday, all tired out. so cute..
She seems to know how to give paw already. How smart. Put him to bed last night, slept till 5 am. We are leaning towards Ski. Long story but fits him. 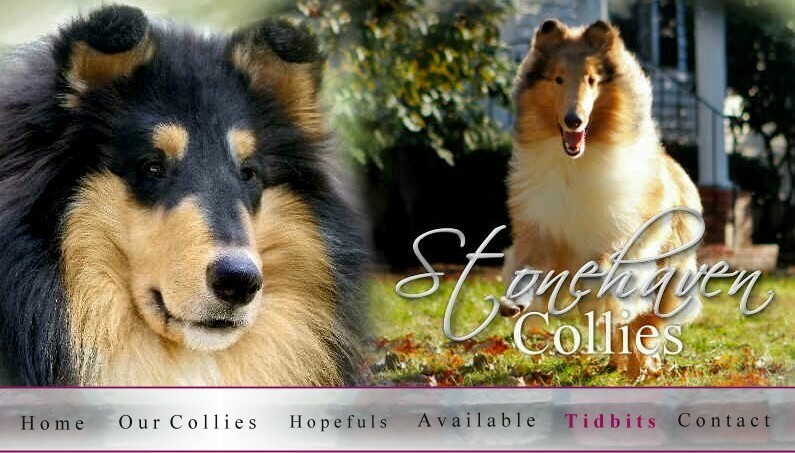 He is such a sweet boy, we are blessed to have another Stonehaven collie in our home. Other dogs are doing well. "We just wanted to send a picture along of Captain Titus!! 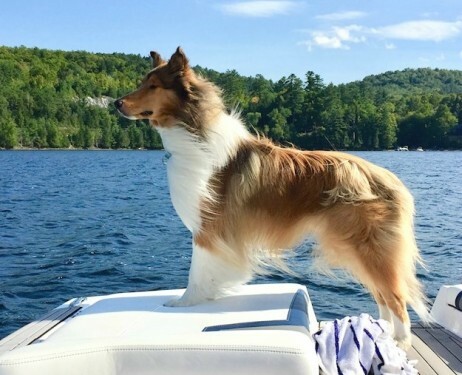 He’s master of the yacht (just kidding) and has a wonderful time cruising from one end of the lake to another. He’s magnificent...but then we are totally biased!" 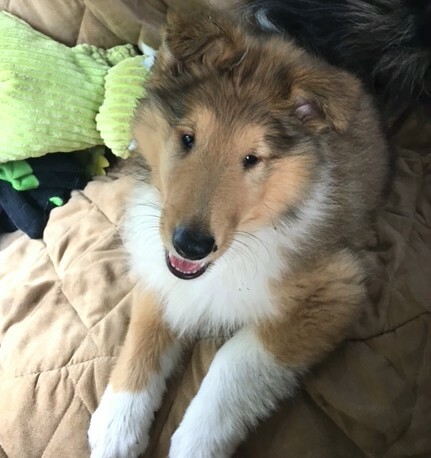 Hi Patti - The puppies are doing great, both are eating well, are very comfortable in their new home and are doing great with housetraining. 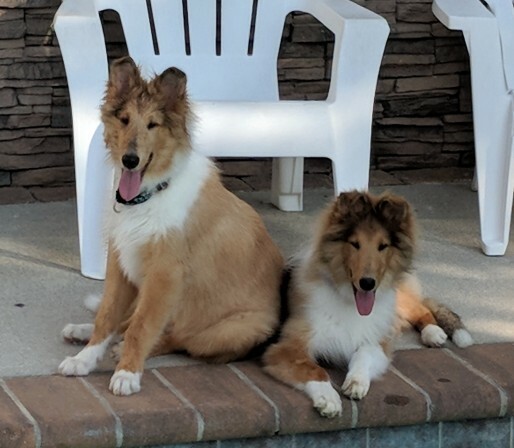 We’re so happy we to have the two of them, they are a great addition to our family and great companions for each other. And an update (9/2/18). 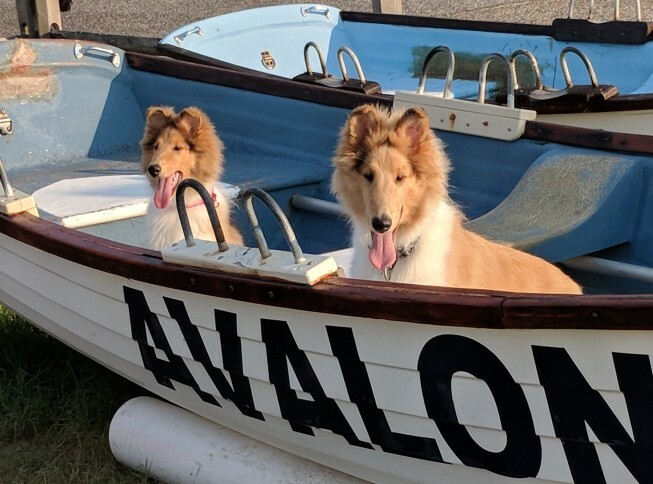 . .
Here’s some pictures of the Pups over the past few weeks on vacation at the Jersey Shore. 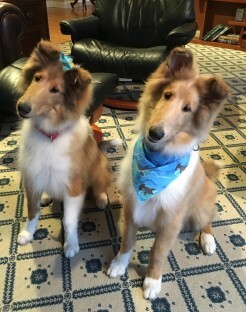 They were the hit to the boardwalk in Atlantic City, couldn’t believe how many people stopped us to see the pups and talk about having Collies growing up. 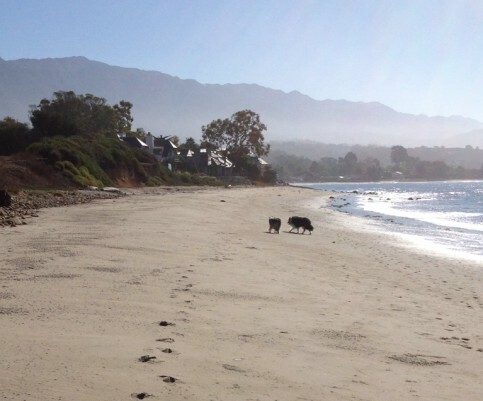 They had a great time at the beach, loved running and chasing the waves. They are getting very accustomed to staying in Hotels and rental homes, so well behaved and such a great temperament to travel with. 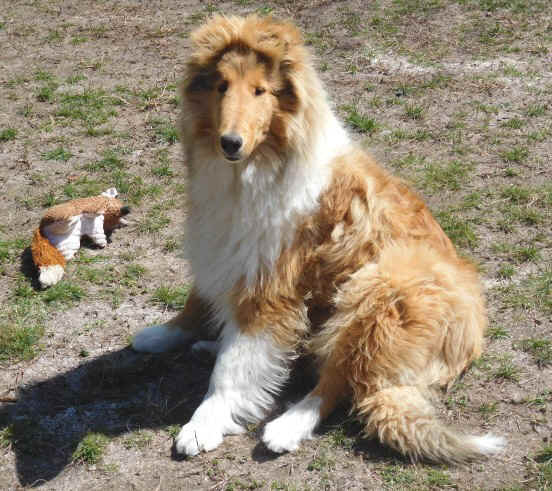 We are excited that one of our Collies has been featured in Dog Fancy Magazine - March 2013 issue! Thank you to photographers Patricia and Robert Petit of Flintpondphoto for submitting their photographs!! 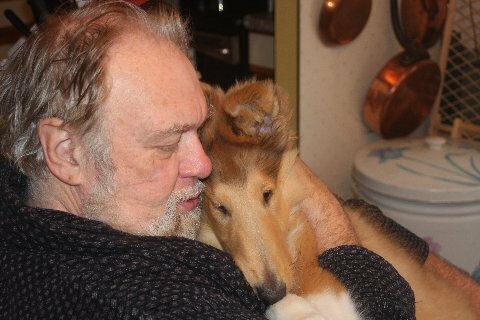 Patti, Thank you so much for such a sweet and lovable puppy. She did great in the car. 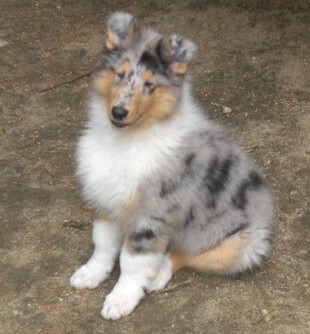 My parents just adored her and now we are on our way home. She is sleeping in my arms and enjoying the ride. I can't thank you enough. I am so very happy and lucky to have her. I wanted to let you know that our boy, now named Rupert or Roo for short has been just the PERFECT addition. He and Oliver have hit it off tremendously well. 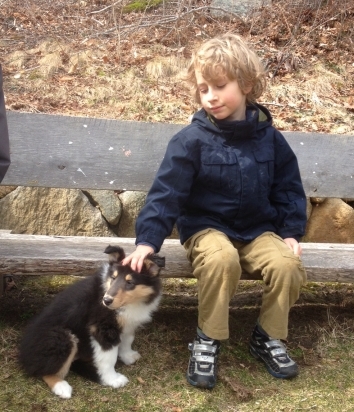 They play together (Oliver is sure to be gentle), snuggle and sleep together and just have been all around buds. 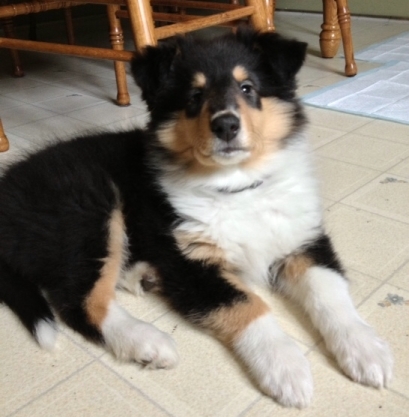 The moment we brought Rupert in our home he ran around wagging his tail and was so excited. We can't thank you enough for him and for raising such lovely puppies. 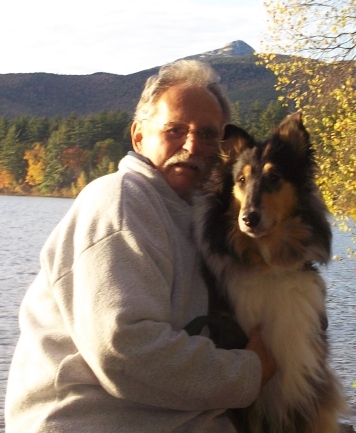 Patti - he is the most wonderful, amazing dog...he traveled home (2 hours in traffic!) without a peep...got right out of the car, calm as could be, and did his business. 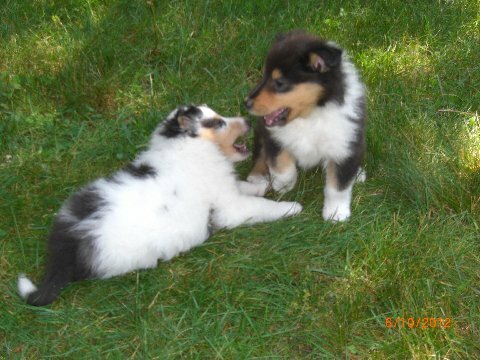 The meeting with Zoe was perfect....they look like near twins and are already following each other around the yard. 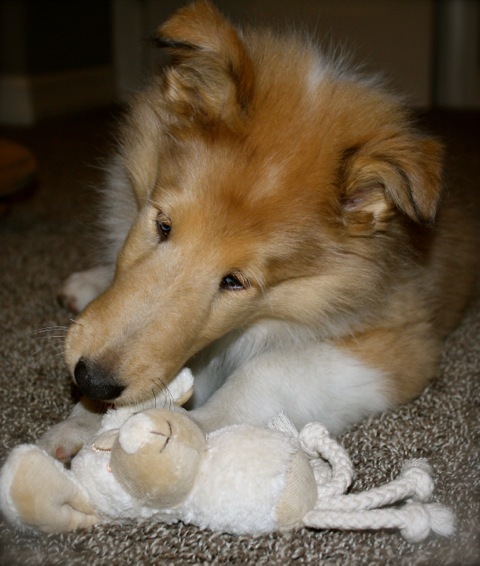 I know we couldn't have found a more perfect dog for our family, and we owe it all to you and your loving spirit. From the bottom of our hearts, thank you for this precious gift. We will treasure him always. 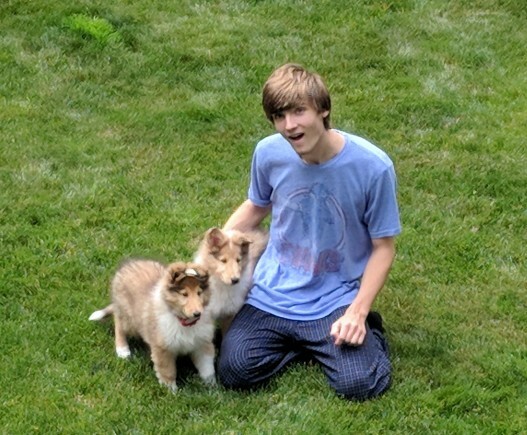 Here is "Lincoln" with his new family! 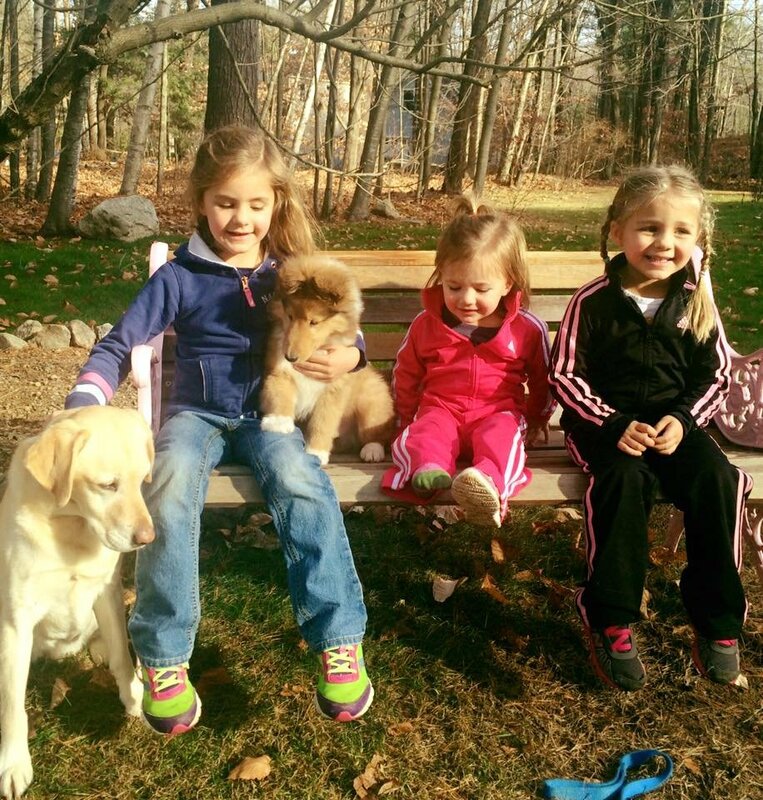 Big sisters Avery, Charlotte and Eve (and Laney his furry sister) absolutely adore him! He is the missing piece our family has been looking for. Most of the time we find him following the kids around, or sitting at his new Mom and Dad's feet. He is a LOVE for sure! 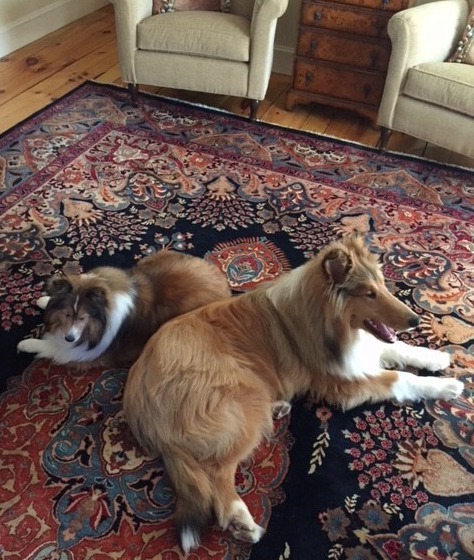 These sweeties are "Laddie" and "Lotta" who are enjoying spending the summer at the Cape with owners Laurie and Belle Tenaglia. 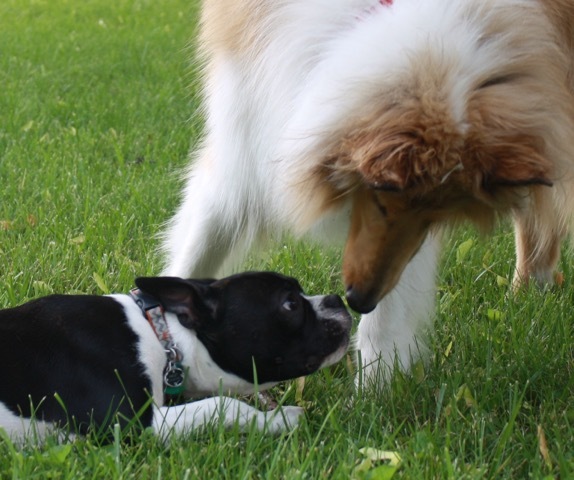 "Stitch" the Boston Terrier and "Sadie" have become fast friends. 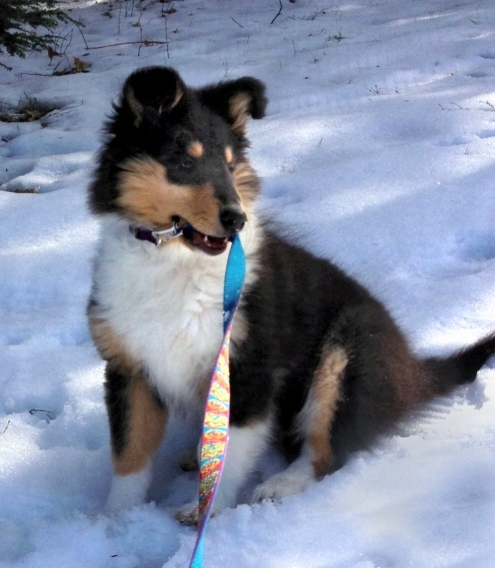 . . Sadie (who is pictured below as a puppy) belongs to owner/friend Cindy. Thanks Cindy for the great pictures!! ". . .Yesterday was a balmy 25 degrees. You would have thought it was spring time. 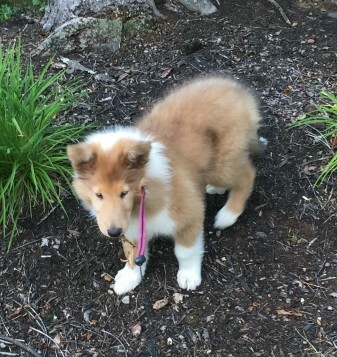 Sadie was outside for a good part of the day and enjoyed every minute of it along with everyone else in Syracuse. We cannot pass Cody (the Springer Spaniels) house without stopping. Sadie will not have it. They just love each other. 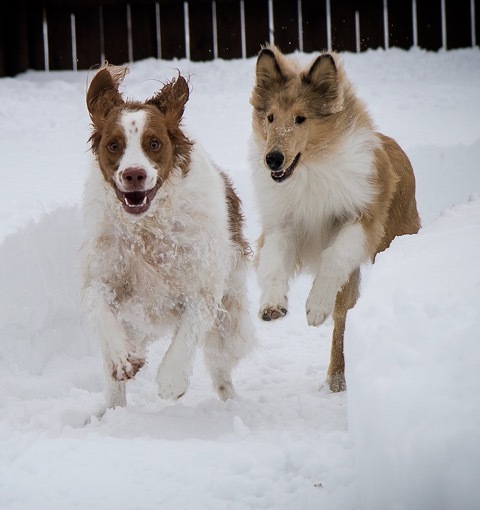 They run every day, except of course when it is -10. On those days she plays inside. 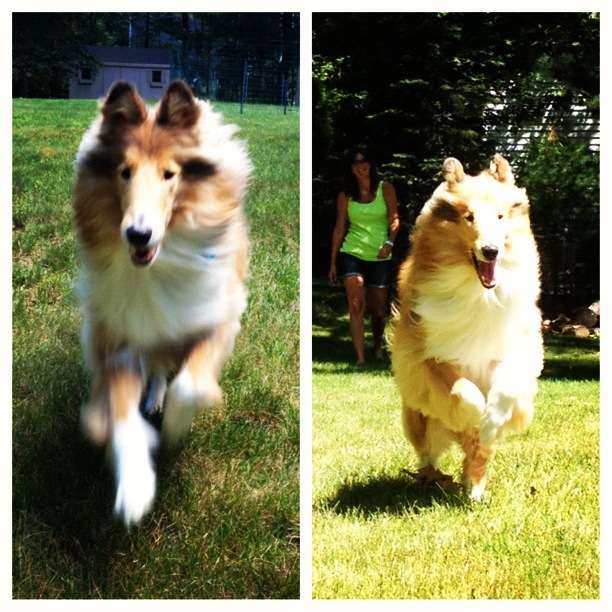 It is so funny to watch her herd her tennis balls. I throw 4 at a time and she tries to bring them all back. Here are a few pictures from our day. 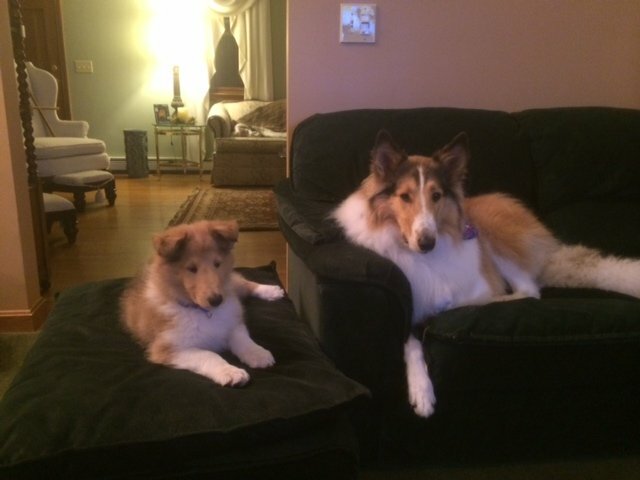 Love your collie friend, Cindy"
"Hi Patty, Our little Nina has been doing great. She got a bit sick on the way back home but we were able to pull over and cleaned her up right away. She hasn't had a single accident in the house so far, not even at night. 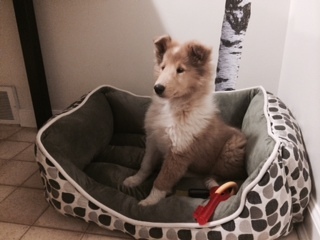 She is enjoying sleeping in her new bed and did not even cry while sleeping in the crate last night. She is such a bundle of joy. 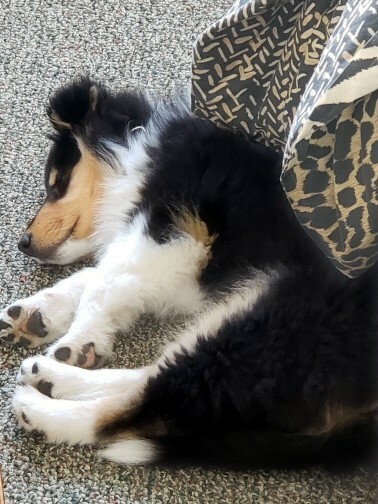 Elodie"
A cute male who went to a customer in CT. . .
"Well little Sadie settled right in last night and slept all night. She is up with me now exploring and playing with her toys. We facetimed my daughter Abigail who is away at college last night and she can’t wait to come home and meet her. She has the sweetest disposition. I don’t want to go to work today. I would love to stay with her all day. I can not begin to tell you the amount of joy she is bringing to me and the whole family in just the little time that she has been here. I met your daughter at the gas station yesterday so she was able to see Sadie off to her new home. She seems like a lovely person. 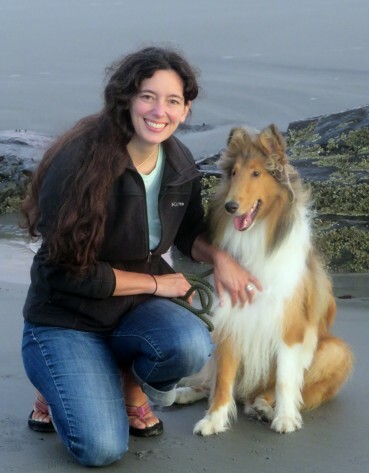 It is so nice to have met you and your family and beautiful dogs. I will send pictures. Cindy"
"Coco" and friend. . .
"Coco" and Nathaniel. . .
My name is "Cookie"! My new dad said I was one smart cookie and everyone liked it! "We all have a snow day today, at least 18" of wet heavy snow and it's still falling...sigh. The photo above is from yesterday morning. 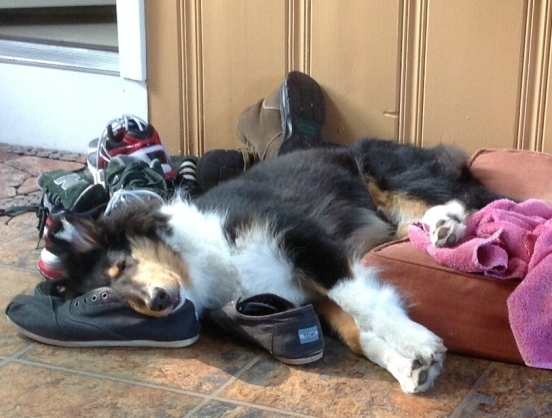 Apparently the shoes were more comfortable to sleep on than the cushion, silly Cookie. I'll absolutely keep you posted on her escapades. You will always have a special place in my heart for all your love & dedication that went into raising these wonderful puppies! 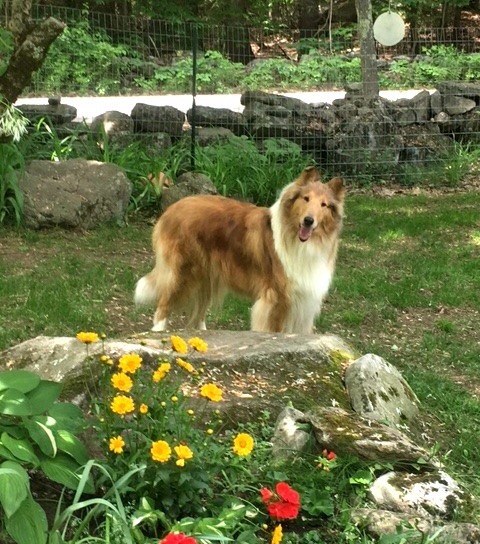 "Romeo" (below) is owned and loved by Peg and Wes Garrison of CT. . .
"love Jesse. . . so very well behaved!!! 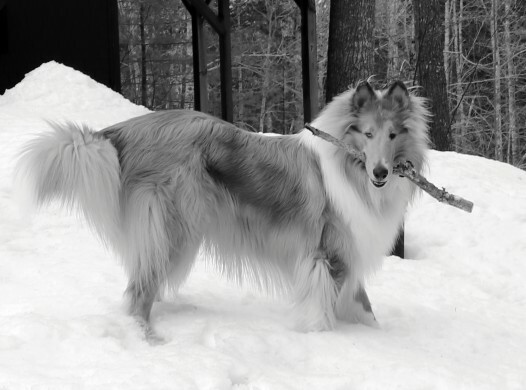 "Brooke (pictured below) will be 3 in Februrary, daughter of Vanessa & Kip. She is a very special girl in many ways. She gives the best hugs, is with my husband Bob all day and when I come home from work I get a special dance, complete with what I call "the Lassie paw lift march" one at a time to greet me along with a high pitch bark and she helps me bring my lunch bag to the house anxiously leading me to take her on her daily walk. 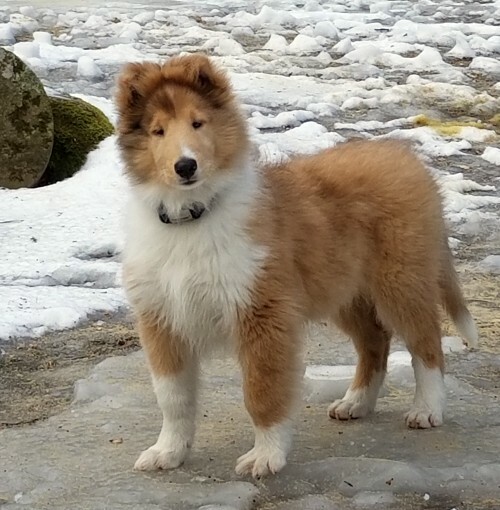 As a life long collie owner, I get emotional when I see her at times out of sheer joy, there is no greater love, sensitivity, shyness and loyalty than that of OUR GIRL. We are in the zone! 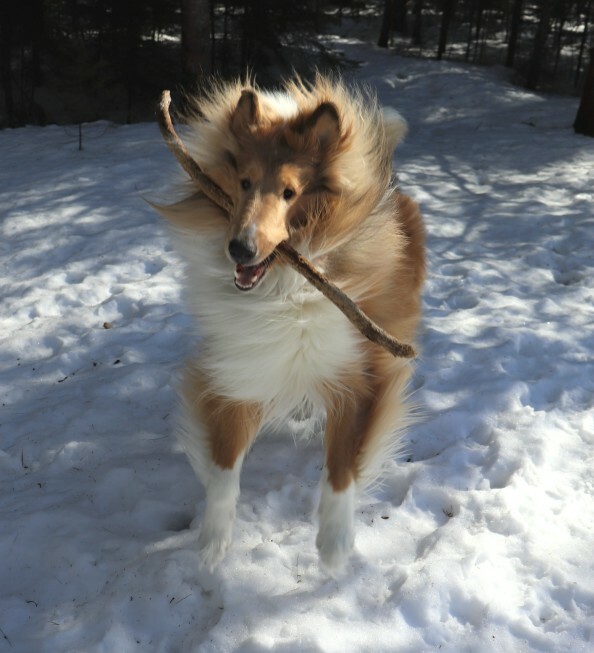 Thanks to Patti who dedicates her life and passion to this amazing, beautiful breed!" "Just wanted to drop you a note and let you know about the puppy. He is a KEEPER! We are just so thrilled to have him in our family. We all spent a quiet, relaxing weekend just getting acquainted and he has adjusted quite well. He sleeps through the night (even the first night!) and doesn't rouse until we do around 7am, we have a sleeping crate in our bedroom. Our backyard has a stone patio similar to yours so he feels quite at home there. 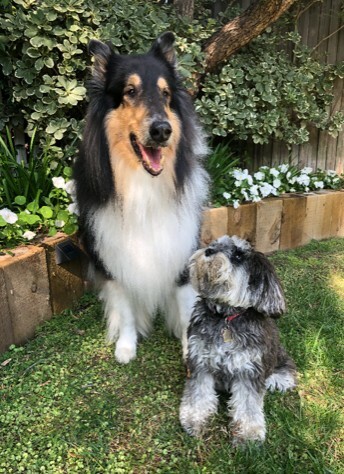 Our boys are just in love and being 9 and 14years they are gentle and understanding of his young age - not crazy trying to rile him up. ~ Thank you again and again, Judy"
"Everyone loves her. 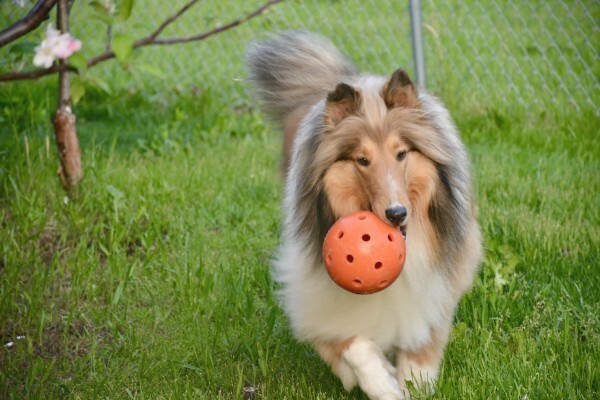 . .
Sassy is having a ball! I am so glad that I was able to obtain her. She is getting along well here. 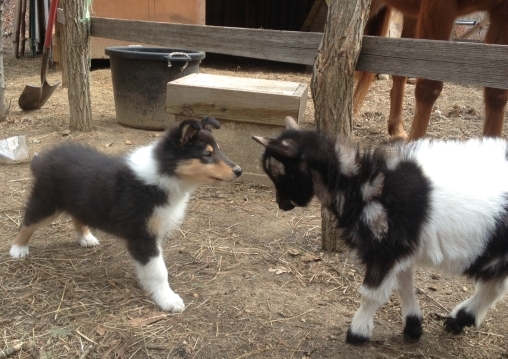 She still has not figured out the geese and goats yet. 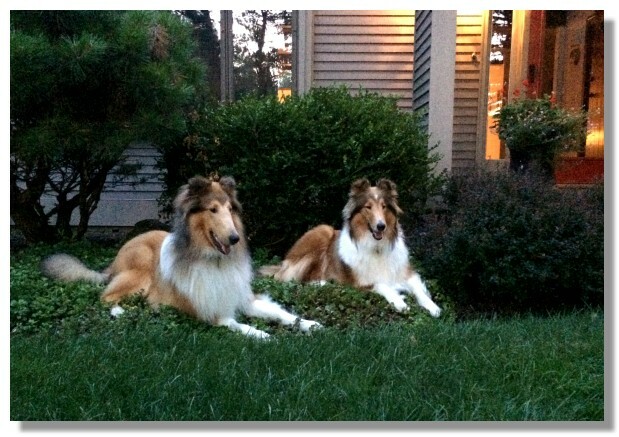 She (Sassy) looks at them behind the fence.~ Love, Pat D."
Owner, Gerry Abrams from CA, keeps me updated with pictures such as this of his dogs.